Thanks for your patience. I finally caught some shots of our new/old, recycled paint. I've lived with beige walls for 2 years. With every stroke of yellow, I could feel my energy return. Old things looked new again. Why does color make such a difference? And with paint so cheap, why did I wait so long? 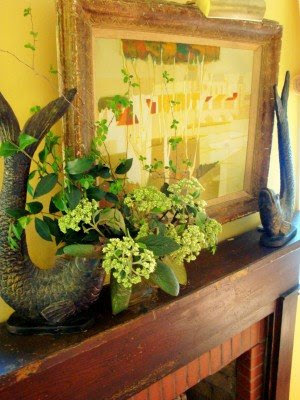 (Top) The salvaged mantel we found for our hidden fireplace, topped with a consignment shop oil painting. (Middle) Picnic baskets hold blocks and toys, with yard sale art stacked for height above. 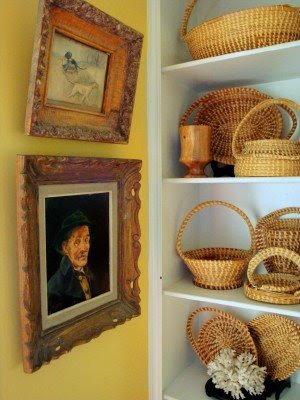 (Bottom) Gullah sweetgrass baskets, collected from yard sales and thrift stores after seeing how expensive they are in South Carolina. Love the color. Doesn't it make your heart sing, something beige can never do? That's almost the exact color of yellow I used in our home. I love it too! I love the color yellow for inside the house,it's so fresh and clean looking. Your home looks just lovely. And I really like those two fishes on your mantel. It's beautiful, Meredith! I think you know I love yellow for the living room. Your shade is just right! It does bring energy and love to a room. Beautiful! The wall color pops so many other colors too. Love the grass baskets with the yellow. Looks so sharp! beautiful...now I want to paint. But I don't want to move all of the furniture...tape all of the edges and drop all of the cloths! The color is perfect in your home...I love it with your sofa and rug and collection of books on the table. As they say, it really POPS! That is a lovely color, and goes beautifully with all your decor. It looks so warm and inviting. Just like I imagine your personality to be. Amen. Those baskets are super expensive. I love to hear the Gullah dialect. Your yellow is warm and beautiful. Why do we wait so long to paint? I just love it, love it, love it! Your making me drool over the baskets! Your home is so beautiful! I have almost the same color yellow in my office! It's so cheery! Perfect! Makes me happy just looking at it! I wouldn't worry about your beautiful new color affecting resale value. Honestly, I think that other women are drawn to homes that are for sale that are beautiful, gorgeous and lovely. Your home fits that bill on all acounts! That yellow is beautiful. We have a very very soft yellow throughout the house - it was actually labeled as antique white, but it's clearly yellow. Anyway. I've been wanting to go for a brighter yellow for ages and seeing how perfect it is in your house is really making me want to pull out the rollers! Beautiful work, Meredith! I love the warmth and contrast that all the different shades of wood give. And, the painting, love that, too! you're a yellow girl, cool beige was never right for you. Glad you took the plunge, it looks so pretty. I love that color. I'm such a fan of yellow, and that is just a *great shade*. I love it! It looks so bright and happy! And I love those fish on your mantel - lovely. Looks lovely. What a happy color. I always love your decor posts. You have a ways with adding just the right touches. The yellow is beautiful! Wonderful job, so cheerful and sunny. I think the reason you wait to paint is because painting a room takes prep and effort. Today I went to Goodwill for the first time in a long time. I purchased picture frames for a photo collage I hope turns out well and some little things for Montessori education experiments at home. I thought of you when I saw blue and white dishes!!! Actually my husband and I stayed at a bed and breakfast in Carmel, CA that had lovely blue and white dishes for their breakfasts. They are beautiful. Honestly I may have to start collecting them too, and I should search your blog to see if you have written more about how you formed your collection. I love the yellow. It is so vibrant! i love your yellow! i grew up with white walls, which i love for the cleanness, versatility, etc. but when we bought our own home (which looked barfed in beige), we went with color, often choosing a general color and then buying mis-mixes (spelling?) or making our own by mixing what we had (left by previous tenants) or were given to us. i LOVE the colors in our home and i do NOT think it makes it more difficult to sell. quite the opposite. nice job!! We've been painting our living room this weekend. It's been four years and three homes since I've been allowed to paint (we rented for the two previous places). I completely get what you are saying. I found myself sobbing last night while painting trim. I'm a bit ashamed by how much I've needed this and yet... I've needed it. Oh my gosh...what a beautiful transformation! Nice work. I have had a lot of yellow walls in homes I've owned. Right now all the walls in my house (a very old house) are a very pale yellow called moonlight white. It was the palest shade on a yellow paint sample. I love it! The house is very small, and this unified everything, and made it look much larger. I just love yellow, and it looks good with so many things. I especially love it with blue (as in dishes!). I love it. Unfortunately I have chemical sensitivities so I can't get away with inexpensive recycled paint. I'm a little jealous. Most of our house is beige too and I'm not so thrilled with it. We just painted a room orange, and after getting over the shock of it, I love having such a lively color. Yellow is just the best color! Great job, and your baskets look great. i love the yelow. i'm going to be doing our new kitchen re-do yellow too! woo hoo! is does your hubby like the outcome? THAT SURELY AIN'T BUTTER CREAM SISTER! That's more like WOW! POP! SUNSHINE, WELCOME!!! Taking notes - Need some energy too! Gotta put kids away so me and hubby can get busy on the common areas! I am inspired to 'do'! I WANT SOME INSIDE SUSHINE TOO! I love your sweet grass baskets!!!!! I have a few and they were from SC- I have looked for them while thrifting and no luck. Also loving the yellow! We just sold our house and our realtor told us that the yellow dining room was a no-no. We had neutralized the rest of the house and refused to do anyomre. For some reason I took her comments personally (hormones)and felt so vindicated when I could show her an article in our local paper that yellow is the new "in" color. Our house sold in less than 3 weeks even in this economy! So I say enjoy the color and forget about resale! I absolutely LOVE it!! I want to do this to our house. The Winters here are so gray that I wanted to paint everything yellow to cope. Is beige really that much better for resale?? We think we're peobably going to have to move in two years. Oh Meredith, it is just beautiful! I love the yellow, we have several yellow rooms in our house and they always put me in a good mood. Love all your yard sale finds too! It's gorgeous! I had a lot of yellow in our last house and I miss it! This makes me want to paint. Love the new color! And love the baskets, too! That looks fabulous! I'm kind of disappointed we'll be putting the twins in the already decorated nursery. Maybe we can paint the TV room that will be turned into a toddler room/play room? Amazing how the coming addition of 2 instead of 1 baby is really turning everything upside down! I'm hoping in all the rearranging to really make the house more beautiful. BEAUTIFUL, just beautiful. What a great job you did. Love the color. Oh that looks just lovely! The beige was all right but this is beautiful and you'll enjoy it all the more for having lived with the beige first. Love the yellow. Your rooms look amazing. We just painted, and are still painting, after 4 years of "builder's white". Ahhhhh. It looks so good! Now you've got me thinking. I have yellow walls and I'm just about ready to go neutral with them, but I don't know that I'm a neutral kind of gal. I'm wondering if it won't turn out depressing instead of neutral. Something to think about. Love it! Our living room and halls are a gold hue and it just breathes life into out home. We just re-did our breakfast room yellow and it makes a HUGE difference in the way I live in here! That's right! I'm blogging in here now! I love it! It's beautiful. I love yellow rooms--so happy and sunny. I love it! 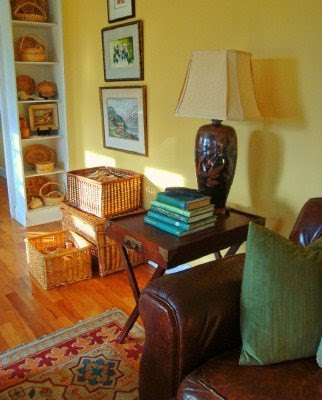 I just love yellow and the cheerfulness it brings to a room. We have plans to paint two rooms in our house with a pretty Honey Bear that is a nice yellow neutral over the too bright yellow in one room and the boring beige in another. It turned out beautiful, Meredith! That turned out just great! I love it! I'm partial to yellow any way - almost all my rooms are yellow. It really is such a happy color especially if you have good light. This is absolutely lovely! The yellow is perfect... you have great style! Awww, the yellow looks beautiful, Meredith! so sunny & bright & perfect backdrop for your things. I love the Gullah baskets. I remember those from Hilton Head & you are right, pricey. Great collection of thrifted finds. Good work, my friend!